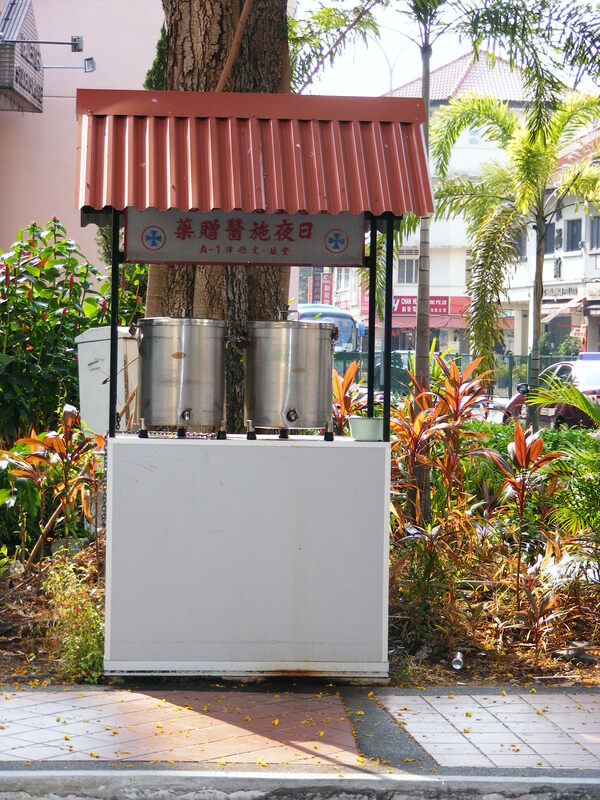 Along Balestier Road on the corner of Boon Teck Road stands a cart hosting a couple of urns – one of clean, fresh drinking water and the other with Su Teh tea (it apparently relieves the effects of heat. In times past when fresh water was a luxury a few of these kiosks sat around Singapore, but this is the last one remaining. The kiosks have always been maintained by charitable institutions and the one on Boon Teck Road is maintained by the charity Thong Teck Sian Tong Lian Sin Sia. 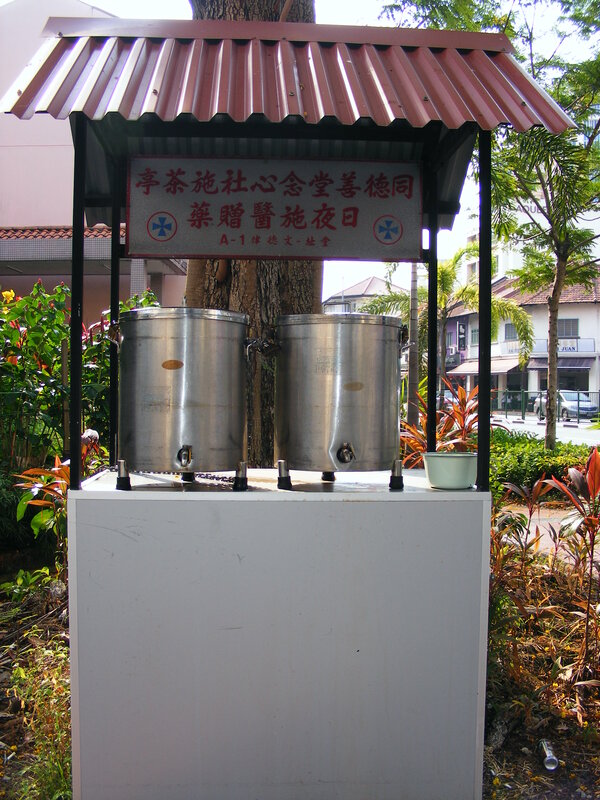 The water kiosk is on the corner of Balestier Road and Boon Teck Road in the Balestier/Moulmein area. Both water and tea are free, but BYO cup! Reference: Balestier; A Heritage Trail, 2011, National Heritage Board. this is such a great idea. In New Delhi a lot of people put earthen urns full of clean drinking water on the sidewalk, especially in residential areas, for pedestrians . It’s a small gesture, but so helpful in the 45 degree heat in Delhi. It’s also considered a kind of good karma to give water to the thirsty in Hinduism. I have often wondered why there aren’t more of these in Singapore. It is a lovely idea and one that shows great community spirity and charity but I guess they’ve been replaced by water fountains/bubblers. Easier to have a piped water source than one that needs manuall refilling? True, but the problem with relying only on the government is that they can never be as numerous as something done by the populace as an endeavor for collective good. Which is why the fountains are probably so few and far between. Yet if every other condo or bungalow had made the effort, one wouldn’t have to go looking for a 7/11 for a dollar fifty bottle of water. Fountains and bubblers also need manual maintenance. Very neat! I didn’t know about these while living there. Thanks for highlighting this!